For many of us, we’re still clinging onto the memories of summer, and the warm weather we’ve been lucky enough to enjoy has certainly been keeping our spirits up. 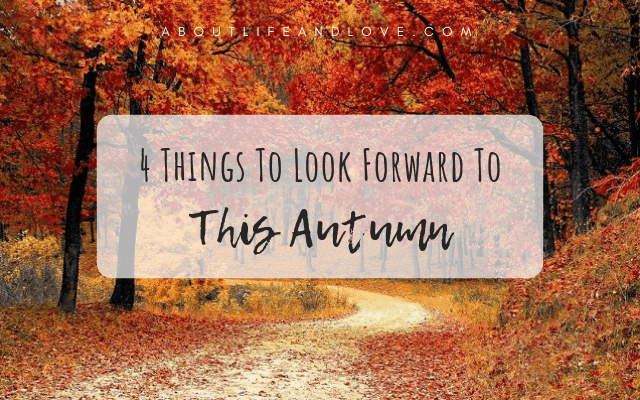 But despite the dreadful chill in the air when we get up, the darkening nights and occasional overnight frost making us feel low, there are things to look forward to this Autumn, you just need to know where to look! Read on for some Autumnal inspiration and discover 4 things to look forward to this Autumn. It sounds pretty dull on paper, doesn’t it? But seeing the beautiful colours and the seasons change is enough to put a smile on anyone’s face. Whether you head out on a local nature trail to view the beautiful foliage or have a look in your own back garden at your trees from The Tree Center, you can expect to see a great show - just remember to sweep up all those dead leaves before they clog your drains and gutters, okay? And who could forget the misty mornings and the long, beautiful hours of golden sunshine? Sure, it might be dark, miserable and gloomy when you get up for work, but just remember to take a moment to watch the sun come up, it’ll set you up for the whole day. In the summer time, many of us feel robbed if we lose a day to miserable weather, especially on our days off! But because rainy, blustery and cold days go hand in hand with Autumn, there’s something rather appealing about them. Rotten weather is the perfect excuse for snuggling down under the duvet on a Sunday morning with a cup of tea and listening to the rain lash at the windows. Bliss. Catching up on some reading time, trying a new face mask, painting your toenails or just watching rubbish TV…Maybe you could get your other half to bring you some breakfast…? So long, summer salad! We tend to opt for lighter meals during the warmer months of the year, so when Autumn rolls around, we’re looking for hearty dishes that will keep us feeling full and plates filled with warmth and comfort. We’re talking, pies, stews, roast dinners, thick soups, homemade breads and pastries and don’t forget to add a lot of cheese! Take advantage of the veggies that are coming into season like pumpkins, sweet potatoes and butternut squash. Homemade apple pie, anyone? Some people refuse to mention Christmas just yet – which is understandable! But for those of us who like to be organised and get into the spirit as soon as possible, now is the time we can start looking forward to Christmas and all the wonderful treats and gifts we’re going to spoil out friends and family with. Not forgetting all those Christmas outings to see Father Christmas, visiting all those Christmas markets, religious services, writing your Christmas cards, nativity plays with the kids and all the excitement it all brings.